Nine out of ten employers admit they always check social media before hiring applicants, it has been revealed. 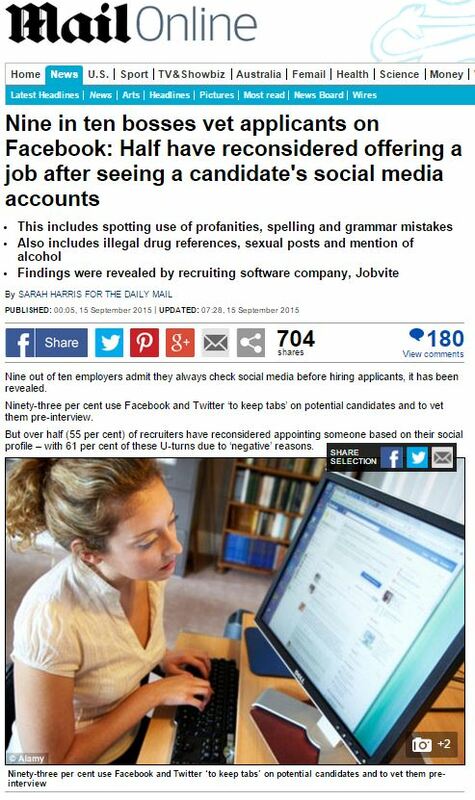 Ninety-three per cent use Facebook and Twitter ‘to keep tabs’ on potential candidates and to vet them pre-interview. But over half (55 per cent) of recruiters have reconsidered appointing someone based on their social profile – with 61 per cent of these U-turns due to ‘negative’ reasons. It comes as a separate survey of 2,000 14 to 25-year-olds by Barclay’s LifeSkills initiative found that one in five (22 per cent) admit to posting pictures from nights out. Kirstie Mackey, head of LifeSkills, said: ‘Employers are increasingly using social media to find out more about prospective candidates prior to meeting and making their hiring decisions. ‘In a competitive job market, it’s important to present yourself in the best possible way – both on and offline. Which, presumably, is precisely the advice-niche Barclays are trying to fill – knowing that most people never change their bank account. Secure customer loyalty early on in their career and you might well have a customer for life. This entry was posted in Barclays, Jobvite and tagged barclays, daily mail, Helena Pozniak, Jobvite, Kirstie Mackey, LifeSkills, Sarah Harris, telegraph on October 19, 2015 by Michael Marshall.